QATAR BOOM ELECTRICAL ENGINEERING WLL in Doha, Qatar. Salam International Investment Limited (SIIL) is a leading conglomerate pursuing a highly focused approach of establishing, incorporating, acquiring, and owning enterprises As an inheritor to a rich over 60 year heritage. Salam International Investment Limited (SIIL) continues to benefit from a strong human capital base and corporate culture. These have assured the company’s continued growth and prosperity through capitalizing on its inherent strengths; namely, its staff, expertise, exceptional client care and its continued drive for improvement in all aspects of its operations. 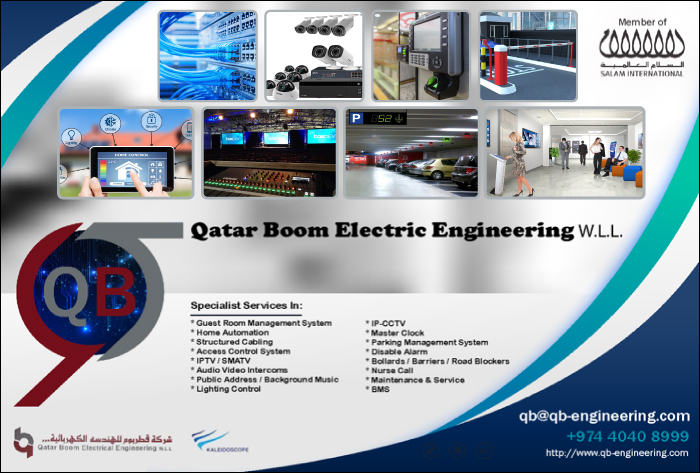 Based in Qatar, Qatar Boom Engineering offer a repertoire of end to end integration and automation ELV solutions. Our expertise lies in providing a state of the art ELV solution which adherers to the concept of enriching aesthetics, giving sense of security that in turn leads to a upgraded lifestyle. We believe that every project is unique with its own set of demands and requirements. Therefore we ensure our solutions are tailor-made to the diverse needs of the client and lay special emphasis on quality, aesthetics and practicality. To provide ergonomic,robust and comprehensive innovations to our partners.